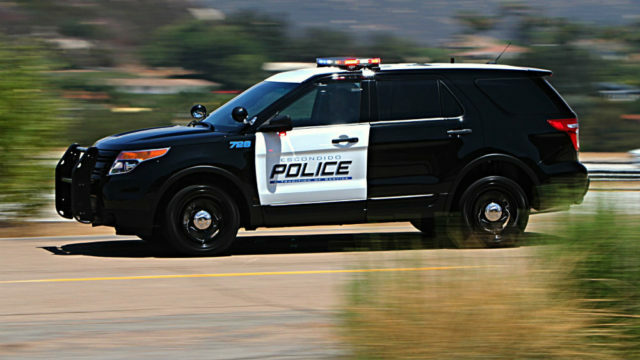 An Escondido Police cruiser. Photo courtesy Escondido Police. A teenage driver in a stolen car led police on a pursuit across Escondido, but crashed into a parked car and was arrested, the Escondido Police reported Sunday. Two children were also on board, and they were arrested as well. In addition, recently burgled property was found inside the vehicle. It all began around 10:15 p.m. Saturday when an officer near the intersection of North Rose Street and East Washington Avenue spotted a car that had been reported stolen earlier in the day, according to Officer Brandon Byler. A patrol officer tried to pull over the stolen vehicle, but the driver fled, sparking a pursuit several miles across town. It came to shattering end in a crash with a parked car near west 12th Avenue and Tulip Street, Byler said. The 17-year-old driver and a 12-year-old passenger jumped and ran, while a 16-year-old passenger remained in the car. All three were quickly arrested, Byler said. The driver complained of neck pain, but was evaluated and cleared for booking into juvenile hall. The three were not publicly identified due to their age.